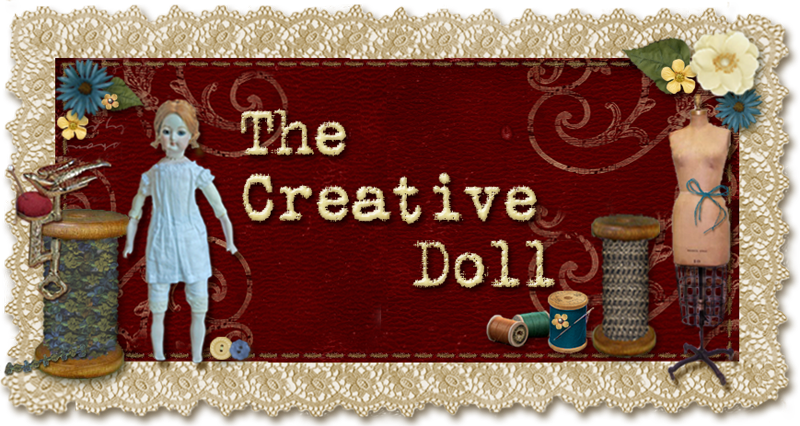 Doreen created many doll kits for those who liked dressing dolls. (There are molds for those who like to do the whole process.) A client that thought my style of dressing a doll would be great for her Doreen Sinnett porcelain sent one such kit to me. What a compliment. Her instructions to me were quite specific, “Surprise me!”That I knew of the client was she liked pastels, closest to white the better, feminine but not fussy, lace and antiques. I tried to pin her down to a period or a style, even asked her where it would be placed in her home. Nothing. By now, I am crying fowl. 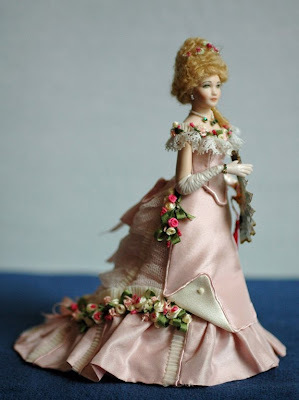 The answer was always similar, “I have faith in you, you will know what to do, I trust you, surprise me.” It was time to rise to the challenge and dress a doll that would make Doreen proud and my client very happy. 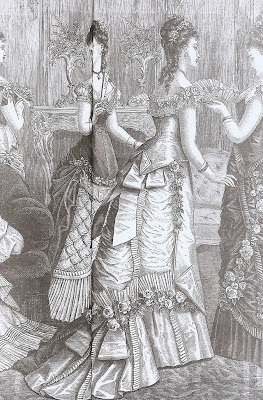 Doreen had dressed her hair in a high style reminiscent of Marie Antoinette, yet still appropriate for a mid Victorian ball gown. I hit the reference books with my list of requirements. There were two periods I felt would work with the hairstyle already on the doll. I landed on a ball dress from a design plate from Harper’s Bazaar 1877. I had the dress! Then the painful, yes painful, decision about fabrics. (Usually that s the fun part, but it had to be great.) 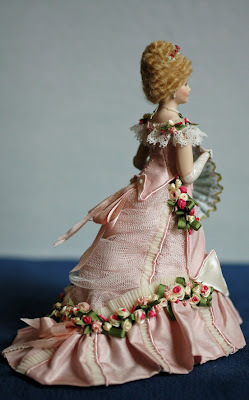 The doll had tiny dots of fuchsia flowers in her hair and knowing the desire for femininity, I went with pink, a light, almost dusty rose. After deciding on the main color, choosing the other colors was easy. When I am unsure, I use a color wheel. Finally, bringing the dress to reality was another matter. Many times, I had to make different parts of the gown. My client and I are so pleased with the result. With her permission, I am sharing this figure with you today. I hope you enjoy seeing her. She is 5 ½” tall.